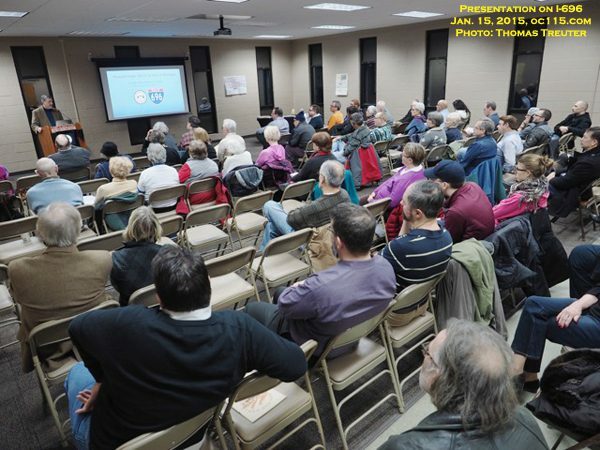 The Historical Society of Pleasant Ridge held a 25th birthday celebration for I-696 on Thursday, January 15, 2015 with approximately 80 residents and interested residents from neighboring communities. They gathered at the Pleasant Ridge Community Center to view a presentation, sign a giant birthday card, and, of course, have a piece of birthday cake. Every day an estimated 130,000 vehicles travel on I-696. Drivers can go from St. Clair Shores at the eastern end to Novi at the western end in 30 minutes, providing a quick and easy route to get around Metro Detroit. This has only been possible for 25 years, since December 14, 1989, although it has been in the works since 1955. It was not always wanted. In fact, there was a long battle to keep I-696 out of Pleasant Ridge, and in the end much was lost and much was gained for this small city of less than one-half square mile in total area. 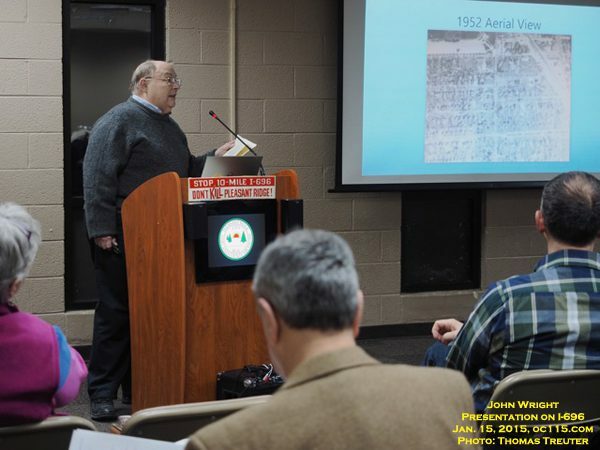 According to John Wright, a 38-year Pleasant Ridge resident and member of the Historical Society who led this presentation, in 1955 the United States Bureau of Roads approved an east-west freeway to connect I-96 and I-94. They were looking to build a superhighway to handle the increasing postwar traffic, and wanted a route other than 8 Mile Road. At that time, 10 Mile Road in Pleasant Ridge was a quiet two-lane road lined with chestnut trees, and a clear view of the Detroit Zoo. Admission to the Zoo was free. Little courts of beautiful homes led to 10 Mile Road. In 1957, the City Assessor was sent to every house in Pleasant Ridge. He went inside each home, and took photographs of the outside as well. These pictures are still available at the Historical Museum. Construction of the first section of I-696 began in 1961, from I-96 to the Lodge, and was completed in 1964. The Michigan Highway Department then worked on planning the next section. The plan was to have I-696 follow 11 Mile in Macomb County and 10 Mile in Oakland County. This meant placing I-696 south of 10 Mile in Pleasant Ridge. City residents and officials felt that this plan would threaten their small community because construction would require the demolition of homes and businesses along 10 Mile Road. In a city so small, it would mean they would lose 10-15% of their tax base. In addition, residents were fearful of the noise and dust that would occur from this ongoing construction plan. There was much uncertainty regarding what would happen to their little town if this was allowed to happen. Pleasant Ridge residents decided to take action. They signed petitions, sold bumper stickers, and protested against the State of Michigan’s plan. A lawsuit was filed by the City of Pleasant Ridge against the State of Michigan. Similar battles were being fought in nearby cities who did not want to lose residents, homes, and businesses for this construction. In the 1970’s, the Highway Department of the State of Michigan started negotiating for the purchase of homes in Pleasant Ridge and other cities along the freeway route. They offered homeowners liberal payouts, helped them to get loans for new homes, and assisted with relocation. Meanwhile, as homes were purchased and demolished, the legal battle of Pleasant Ridge vs. State of Michigan continued. The concern of residents and city leaders shifted from stopping this freeway from being built in their city to minimizing the damage. In 1979, the east section of I-696 opened. It ended at Lahser, and then started again at I-75. The nine miles in between were not yet a part of the freeway. In time, it did come through Pleasant Ridge. A total of 124 homes and 9 businesses and industrial sites in the city were lost, along with recreational land owned by the city. I-696 was completed in 1989. On December 10, 1989, the first and only “Run the Reuther” 5K and 1 Mile Run/walk was held. Five thousand people, including Wright, participated in the one chance to walk and run on the new freeway before it opened to traffic. He still has the t-shirt he received on that day. Opening day was December 14, 1989 at 5:00pm. Governor Jim Blanchard led the ribbon ceremony, and it was shown on all the news programs around Metro Detroit. At the birthday party, attendees saw clips of Bill Bonds, Sherry Margolis, Huel Perkins, Joe Glover, Dayna Eubanks, and others reporting on the event. 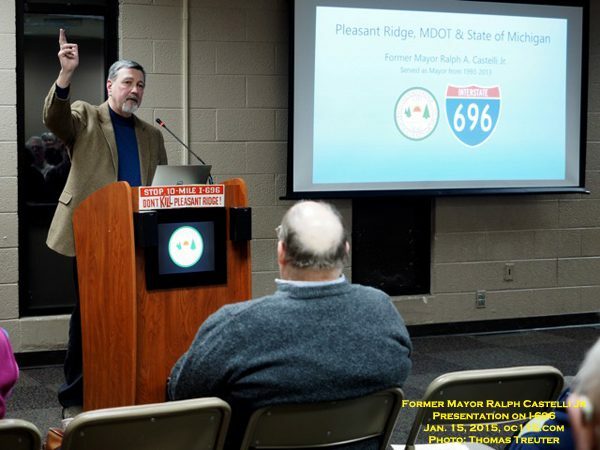 Although I-696 was open, and local drivers were happy to have a shorter commute from east to west, the issue of the losses it caused for Pleasant Ridge was still being argued legally. Ralph A. Castelli, Jr, Mayor of Pleasant Ridge from 1993-2013 spoke about that at the celebration. The city lost 15-20% of their tax base from the freeway, and they also lost recreational land. Taking recreational land in a city so small had a serious affect on the city. The State of Michigan came up with a good faith estimate of $690,000 that they were willing to pay Pleasant Ridge. However, partway through litigation, it was discovered that they State actually had a higher estimate by about $300,000, which the State would also have to pay. They went to mediation, did not agree on a settlement, and so went to trial. The verdict was in favor of Pleasant Ridge for over $3,000,000. With attorney fees and other costs, the State would have had to pay close to $8,000,000. The City of Pleasant Ridge knew it was likely that the Michigan Department of Transportation (MDOT) would appeal, so talks began between Castelli and MDOT. They settled for $4.25 million. The feeling of doom and gloom that permeated the city when the discussion of building I-696 began and lasted through construction and beyond had finally turned around. 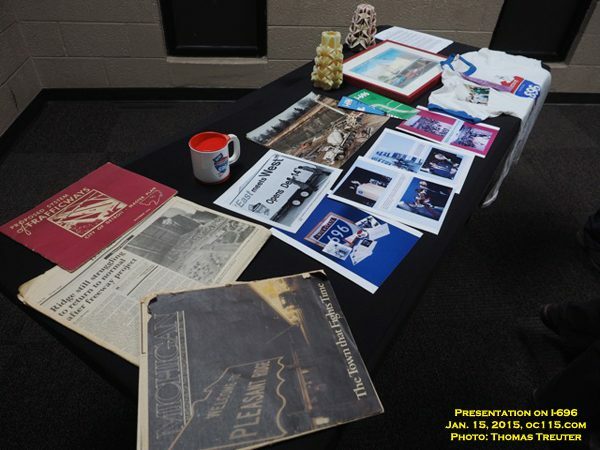 Twenty five years later, Pleasant Ridge residents celebrated the birthday of I-696 with memories, stories, and recognition of how their city persevered through every challenge. Cheryl Weiss is a freelance writer, a blogger, and a retired teacher from Oak Park.